Last week, when my husband and I were stopping at the food court in the mall, I saw people lining up for the crepes. Some people ordered savory crepes, and some ordered sweet crepes. They all looked delicious. So I was telling myself that I should make my own crepes at home someday. This morning, my craving for crepes struck at breakfast time. At the same time, I found a bag of seaweed snacks in the pantry by coincidence. So the idea of making savory crepes with seaweed came to my mind. The seaweed snacks can easily be found in most Asian markets. They are individually packed and can be considered as healthy snacks. I also found some simulated king crab sticks in the fridge that could also be added to the crepes. As this was my first attempt, I wasn't sure if the turnout would be good. Luckily, I was quite happy with the result. Making crepes is fun. In a bowl, beat eggs, flour, salt, milk and chicken broth together. Add oil to the mixture, and continue beating until smooth. Heat a frying pan over medium low heat. Brush with oil. Place a piece of the seaweed snack in the center of the pan, sprinkle some chopped green onions all over the pan, and pour one scoop (regular ice cream scoop) or 1/4 cup of the mixture over. Tilt the pan until the mixture covers the surface of the pan. It's fine if the green onions move around, but the seaweed should remain in the center. Cook for about 2 minutes. Flip to the other side and cook for another 2 minutes or until brown. Remove the crepe from the pan, and place the crepe on a plate with the seaweed side down. Fold in half. 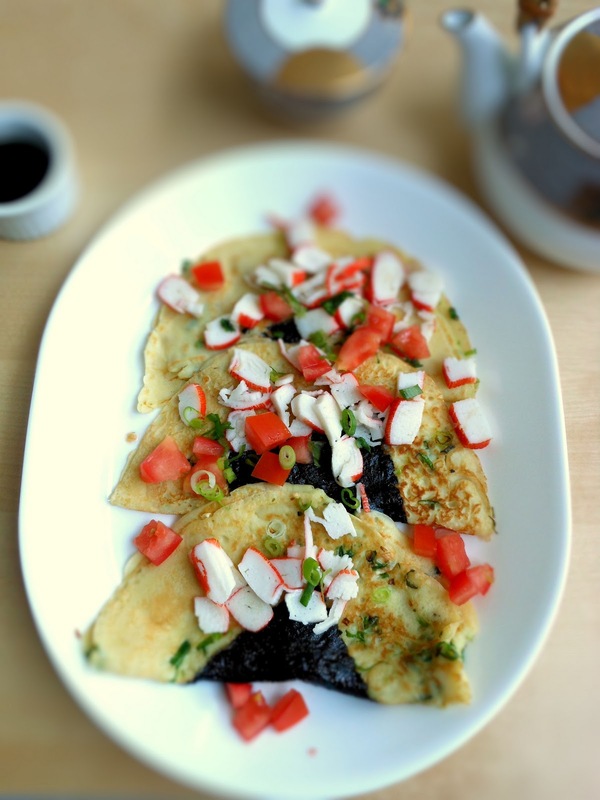 Sprinkle diced simulated king crab, diced tomato, and some green onions over the crepes. Serve with or without the teriyaki sauce. Makes 6 to 8 crepes.